I-guard sterile eye/ear drops: Each ml contains 5 mg of Chloramphenicol BP. I-guard contains ChIoramphenicol which is a broad spectrum bacteriostatic antibiotic. It is effective against wide range of Gram-positive and Gram-negative bacteria, cocci and large viruses. ChIorarnphenicol is usually well tolerated and is well penetrated in non-inflammed eye better than any other antibiotic regardless of the mode of administration, resistance is slow to develop, moderate in nature and not necessarily permanent. 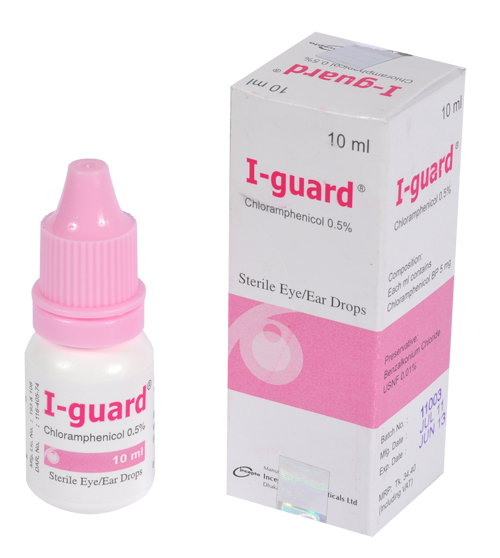 I-guard Eye/Ear Drop is used in Chloramphenicol susceptible organisms in infected eyelid, cornea (corneal ulcer), conjunctiva, lachrymal canal system and anterior of the uvea. It may also be used in Trachoma, Zoster and Parinauds conjunctivitis. It is used as an adjuvant therapy with other drugs in the treatment of herpes simplex and for the prophylaxis of bacterial infection before and after surgical operation and after fire and chemical burns. It is beneficial in rinsing the lachrymal canal as a preventive and curative of infections. Chloramphenicol can inhibit or destroy the bacteria present in ear canal. Adults, children and infants (all age groups): One or two drops 4 to 6 times a day should be placed in the infected eyes. If necessary the frequency of dose can be increased. Treatment should be continued for approximately 7 days but should not be continued for more than three weeks without re-evaluation by the prescribing physician. 2 to 3 drops into ear canal thrice or four times daily. The use of chIoramphenicol alone in Ionger period or frequent intermittent use may result occasional stinging, itching and in rare cases allergic eyelid eczema in some patients. Prolonged use of antibiotic may result in over growth of non-susceptible organisms and fungi. This medicine should not be used regularly in prolonged period of times. If new infections appear during medication, the drug should be discontinued and appropriate measures should be taken. Pregnancy: This medicine should be used with caution during pregnancy, and only if the expected benefit to the mother is greater than any possible risk to the fetus. Lactation: This medicine should be used with caution by breastfeeding mothers, and only if the expected benefit to the mother is greater than any possible risk to the baby.